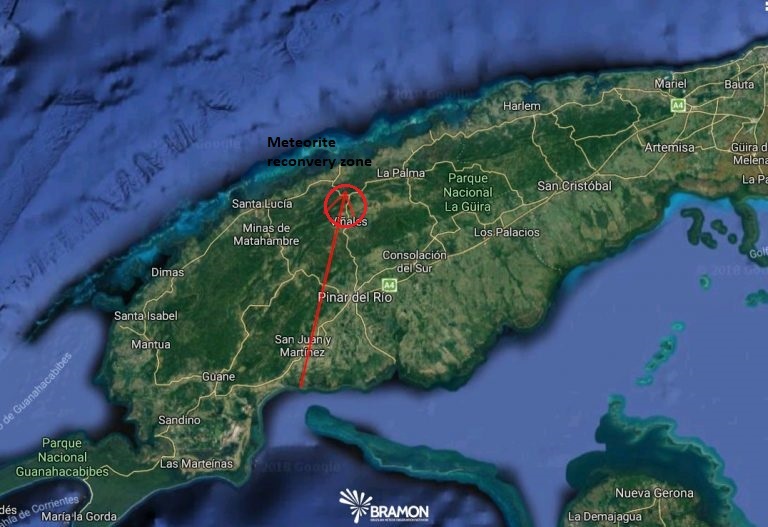 The US National Weather Service twitted that its radar may have detected a huge meteor (a fireball) near Viñales, Cuba around 1:21 pm last Friday (February 1st 2019). The AMS has received only 13 reports from Florida so far about this event. The map below shows the first estimated ground trajectory of the fireball obtained from these witness reports as well as an image obtained from the GOES-16 NOAA Satellite used for the detection of meteoroid impacts by Peter Jenniskens’ team (SETI Institute). While the trajectory computed based on witness report only indicates that the fireball was traveling from North East to South West, some analysis suggest the fireball was actually travelling the opposite way . Our trajectory is an estimate base on few reports on just one side of the trajectory – note that the end point of the AMS trajectory is less than 11km away from the meteorite location as noted by Marc Douglas Fries from NASA (ARES). Several people noticed the wrong direction of our initial trajectory, among them Twitter users Scott Sutherland, Clemens Rumpf and Daniel Fischer. Why our trajectory is wrong? It’s a good question. Unfortunately, many factors can affect the trajectory we compute based on visual witnesses only (weather, distribution of the witnesses, etc.) We only received 13 reports so far about this event. 12 of them are from witnesses who were in Florida at the time of the event: it could be an explanation. This paragraph has been written by AMS’s Operation Manager, Mike Hankey. Late January and February are known to have an increased rates of meteorite dropping fireballs. Is this a missed perception or reality? If we look back over the last 10 years of meteorite falls, there have been a total of 77 falls from the end of 2009 to the end of 2018. An even distribution of these events over each month would result in .6 meteorites per month/year or 6 meteorites for each month over the last 10 years. Between January 2009 and January 2018, 9 known meteorites have fallen in the month of February. If we extend to a 6 week period of Jan 15 to Feb 27, the total is 14 meteorites which is 1.5x higher than the even per month distribution. The even distribution of meteorites per week/per year would be .14 meteorite per week of the year or 1.4 meteorites per week over 10 years or 8.4 meteorites in 10 years. Over the last 10 years, the 6 week period of late Jan into February has produced 14 meteorites, which is 1.75x higher than an even distribution. Maybe there is something to these February meteorites after all. I observed this meteor while I was on the cruise ship Celebrity Equinox. I took a photo of the smoke/gas trail at 1319 in the Gulf of Mexico off the coast of Cuba. I took the photo approximately one minute after seeing the meteor/ fragment. My photo appears to have recorded my location from my iPhone. Have you shared your photo? Have you a link? Does this include meteorites, found and/or fireballs spotted?? I am curious how many are found and reported per year?